Make yourself at home in a setting of luxury, refinement and history. 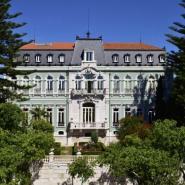 Located in one of the most tranquil areas of Lisbon the hotel Pestana Palace was born from the restoration and refurbishment of the former Marquês de Valle Flôr Palace, dated from the 19th century and classified as a national monument. This majestic and attractive palace was built by an entrepreneur who made his fortune with successful agricultural endeavours in São Tomé and Principe. His connections to France influenced the design of the building, with styles from the Luis XIV, Regency, Luis XV and Luis XVI eras, creating a surprising historical setting. In the impressive inner spaces the rooms and halls are ideal for parties, banquets or other prestigious events. The rooms and suites, located in a new wing, are of the utmost comfort and fully equipped. In the palace there are the luxury suites with a refined epochal decor. From the restaurant one can appreciate the view onto the lush gardens that surround the palace and on warmer days one can also enjoy a meal served by the pool in a 19th century oriental pavilion. A visit to the historical city of Lisbon is also recommended, wandering through the typical neighbourhoods and becoming acquainted with the main museums and monuments. At night, visit the Docas or enjoy live music at the bar of the magnificent Pestana Palace. Exiting Lisbon Airport, turn right onto the E01/Segunda Circular, after 5 km take the exit for the E01/Eixo Norte-Sul towards Alcântara/Praça de Espanha until Avenida de Ceuta. Nearing the end of this avenue, turn right onto the General Domingos de Oliveira Square and onto the Rua de Alcântara. Turn right onto the Calçada da Tapada and then left onto Rua João de Barros. Finally, turn left onto Rua Soares de Passos and then right onto Rua Jau where the Pestana Palace is located.